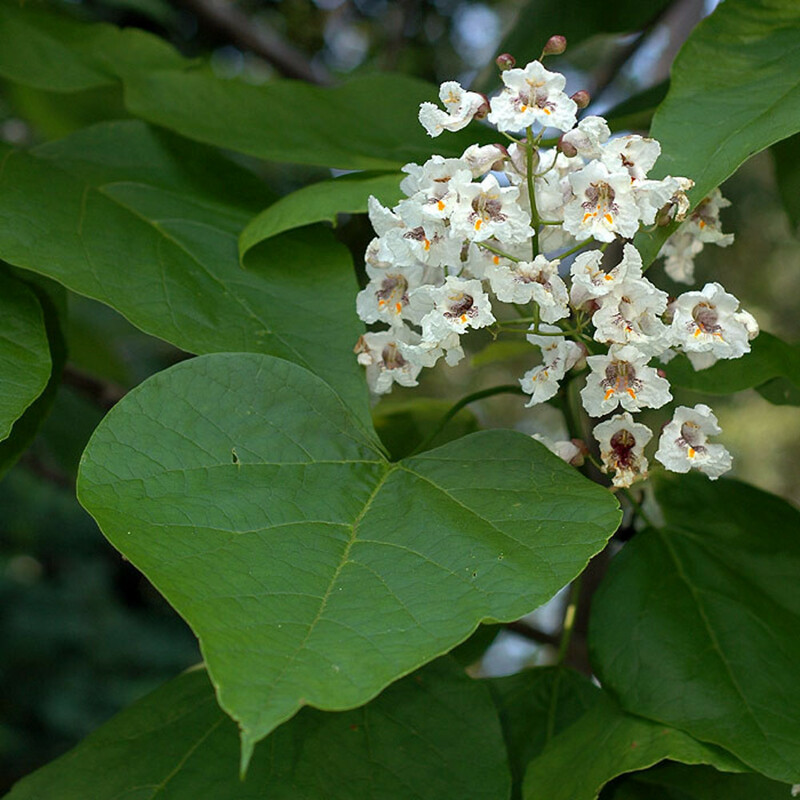 Catalpa bignonioides tree in bloom. Arte Y Jardinería. artyjardinerria.com (Accessed 12/2017). 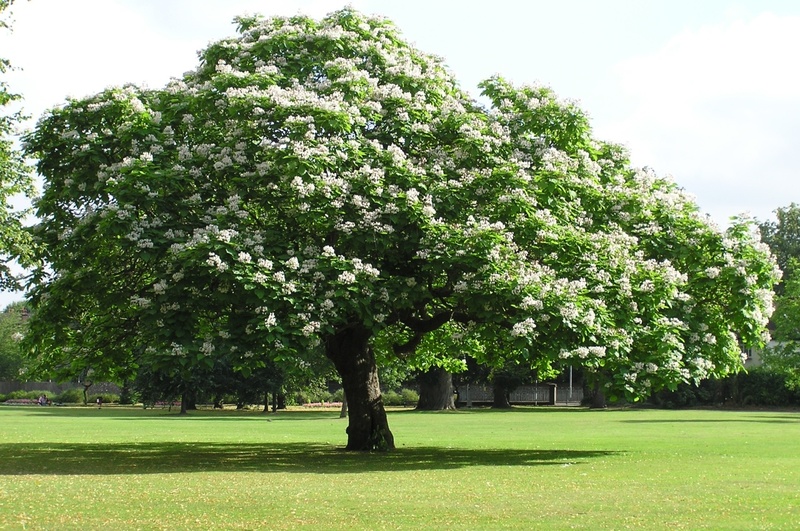 Catalpa bignonioides is a tree to 15 m tall, branches widely spreading; bark gray, flaky, twigs stout, hairless, pith continuous, leaf scars opposite, broad, nearly circular, vein scars forming a ring inside leaf scars; winter buds. 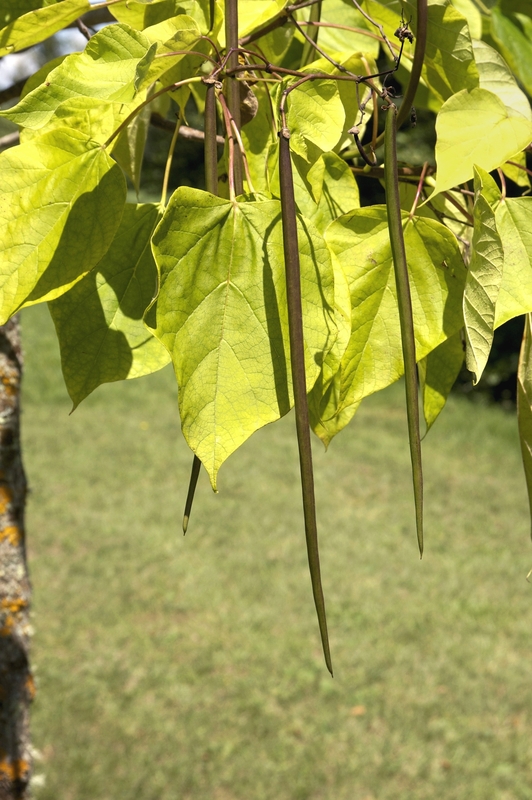 Leaves opposite, often whorled at ends of twigs, stalk 8-16 cm; blade, 10-20 cm long, 7-20 cm wide, broadly egg to heart-shaped, finely hairy below, tip abruptly pointed, base blunt to slightly lobed, smooth above, finely hairy below, unpleasant odor when crushed, expanding in late May; winter plant leafless 184 days (Britton 1874). Catalpa bignonioides.David G. Smith.New England Wild Flower Society.gobotany.newenglandwild.org (Accessed 12/2014). Flowers white with 2 yellow stripes inside, densely purple-spotted, broadly tubular, bilaterally symmetrical, 3- 4 (5) cm wide across top, lower petal lobes entire, May-June; inflorescence 15-20 cm. Fruit dry, hollow, linear, thin-walled 20-40 cm long, 0.6-0.8 cm wide, splitting open to release seeds, wings gradually narrowed at ends, with tuft of short hairs with tufts of hair at tips of wings, pods persistent on tree into winter. Origin: Southern U.S. escaped from cultivation in north (Dirr 1990; Rehder 1986). Habitat: Second growth, woodland, edges, fill, weedy, soil pH 5.5-7.5 (USDA, NRCS 2010). Notes: Rather short lived 40-50 years (USDA, NRCS 2010). Much like C. speciosa but smaller and blooming about 2 weeks later (see below).